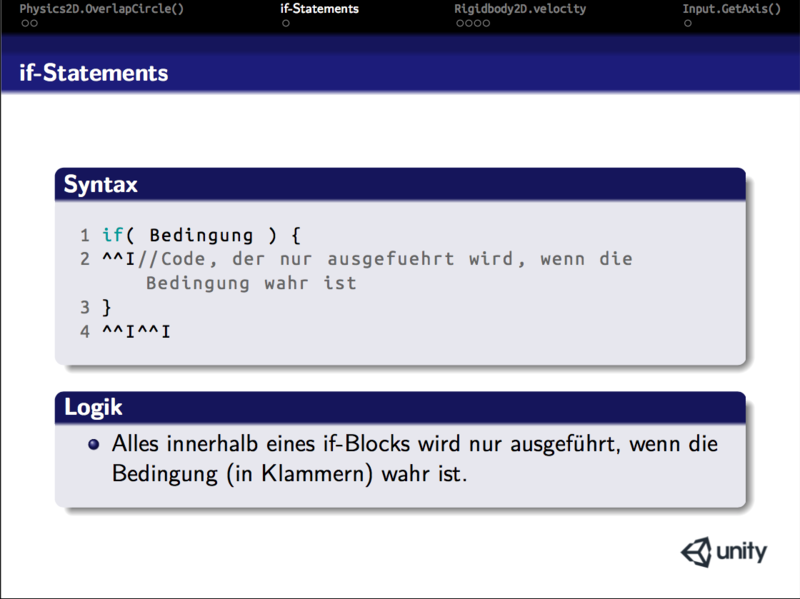 In beamer class, when i compile using LaTeX, the output pdf results perfectly the way i expect it to. But when i change it to XeLaTeX, in the lstlisting environment, every tab in the code results in a "^^I"-Placeholder (See output-pdf below). How do I fix this? \item Alles innerhalb eines if-Blocks wird nur ausgeführt, wenn die Bedingung (in Klammern) wahr ist. Class beamer reads the frame in a verbatim manner by changing the category codes of many letters to 12 ("other", like digits). Otherwise, with the usual category code, the tabulator would be printed as space character. Then, when the file is written by XeTeX, it sees an "unprintable" ASCII character (a "control" character with ASCII code smaller than the space character) and uses the alternative notation with printable ASCII characters using ^^I. The behavior of pdfTeX is different in this matter. Not the answer you're looking for? Browse other questions tagged beamer xetex listings verbatim or ask your own question.